A team who works together to make your visit here an enjoyable one! We love getting to know our patients and hope this page gives a little insight into our staff. 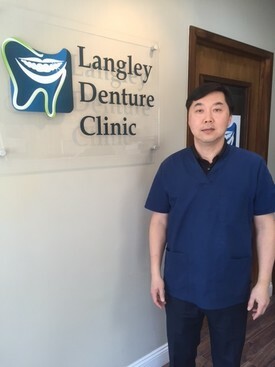 Owner & Registered Denturist of Langley Denture Clinic, located in the Walnut Grove area of Langley, BC. Frank has served Langley and the surrounding areas since 1997. Frank has been involved in the dental industry for many years apprenticing from his father who was a Master Dental Technician. Frank served on the Board for the College of Denturists for British Columbia as well an active member of the Walnut Grove Business Association. Frank is a qualified chair side clinician and lab technician. He is a member in good standing with the Denturist Assoc. of Canada and B.C. In 2011 Frank completed a two year tenure as a Board Member for the College of Denturists for B.C. In addition Frank regularly attends a study club which keeps him up to date with the latest in the latest technology and in implants related to dentures. Frank’s chair side manner is gentle and proficient. You will know right away you are in good hands. Langley Denture Clinic is also a teaching clinic and Frank is proud of the mentoring of new graduates from the Denturist Program allowing them to practicum with him. Frank is a proud supporter of the Royal Canadian Legion and a supporter of the BC Seniors Games. Frank is married, with two children and is an active member of his church and when he has time his passion is Golf. Dionne joined the clinic in the role of Treatment Coordinator in 2014, with twenty years of experience in dentistry she is able to assist with all insurance claims and will help you to navigate the terms and conditions of your dental plan.